Apple and Plum are a pair of traditional 18th century cottages set within their own walled garden and adjoining the orchard on the Deans Court estate. Recently redecorated the cottages have a contemporary yet homely feel. Chalk white walls, Farrow & Ball paints and re-upholstered vintage furniture provide the perfect space in which to relax and unwind. Take a drink, or sketchpad, to the terrace and enjoy the view across the Stour Valley, where the cows browse on the meadow by the cricket pitch and the towers of Wimborne Minster hover above our ‘crinkle-crankle’ kitchen garden wall. Apple sleeps 6 and has an Inglenook fireplace with a wood burner. Sisal carpets lead to simple, beautiful bedrooms where linen blinds frame the meadow views. A modern, fully equipped country kitchen makes cooking easy and fun, especially once you see our Deans Court welcome basket all our guests receive local, homemade treats on arrival. 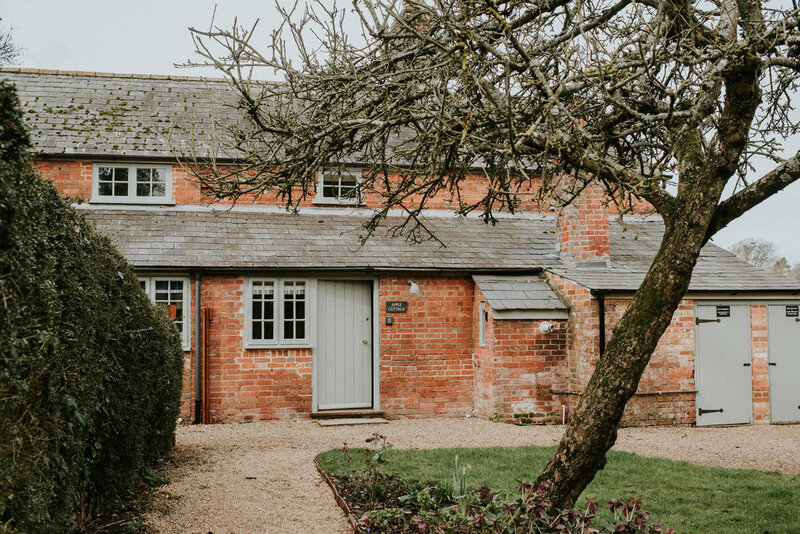 Expect to be greeted with freshly baked bread from our local bakery, locally sourced free-range eggs, home-baked treats, locally produced jam and of course milk in the fridge and a selection of Dorset teas and ground coffee. Although within the Deans Court estate the cottages are only a few-minutes' walk into Wimborne's town centre. The rest of Dorset is within easy reach by car, with the blue flag beaches of Sandbanks and Bournemouth half an hour away, while the Jurassic Coast can be reached either via the little chain ferry from Sandbanks, or 'by land' via Wareham (40 mins). We have four pricing seasons (low, mid, high and Christmas) - and our bookings are either 3-night weekends (Friday to Monday), 4-night midweeks (Monday to Friday) or 7-night full weeks (arriving either Monday or Friday). Check-in from 16:30, Check Out by 10:30.